Synopsis: Andrea Cooper knows everything about her mother Laura. She knows she’s spent her whole life in the small town of Gullaway Island; she knows she’s never had any more ambition than to live a quiet life as a pillar of the community; she knows she’s never kept a secret in her life. Okay, I think I need a break from crime books for a while. I wanted to love this book SO MUCH. I love Karin Slaugher but I recently read ‘The Good Daughter’ and I found it to be a bit below her usual standards. Nevertheless, I was exciting to get stuck into this one and I was hoping that it would prove to me that ‘The Good Daughter’ was a one off… but it didn’t. I’ve said this before and I’ll say it again because it’s important: This isn’t a bad book!! But, when you have a favourite author, you expect AMAZING things from them… which is unfair, I’ll admit, but that’s just how it goes. Anyway.. let’s get back to it. What’s the book about? Andy is a 31 year old who is back to living in her home town, living in an apartment above her Mum’s garage. She previously lived in New York but returned home when her Mum was ill. Now, she’s stuck in a job that she doesn’t really care about, just wallowing through life. Laura, Andy’s Mum, takes Andy out to a diner for a birthday lunch. Whilst they’re there, a gunman storms in and shoots dead 2 people and then turns on Andy. To save her daughters life, Laura kills the gunman. But the thing is…. It looked like Laura had done it before. There was no emotion in her face when she did it and she doesn’t seem to show any remorse for killing a young man. In fact, as soon as it’s done, she acts like it didn’t happen. Firstly, I didn’t like any of the characters which was a problem because it meant that I didn’t really care what happened to them. Andy is completely useless. She seems to have been mothered too much her whole life and when she feels uncomfortable, she loses the ability to form simple sentences. It’s just so frustrating and made me do countless eye rolls! And Laura….don’t even get me started on Laura. She has this deep hatred for the police… which I don’t get because it seems like they gave her a pretty good deal in the past. The other thing is the plot. It wasn’t a bad plot, but I much prefer the darker Karin Slaughter plots. The whole feel of the book wasn’t what I was expecting. I was expecting a gritty, gruesome crime story and that’s not what it was. The plot was so slow in some areas. In addition, I figured it all out before the big reveal, which is always a huge disappointment! 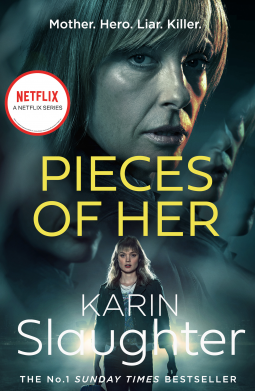 If I had read this book without knowing who the author was, there is NO way I would of known it’s a Karin Slaughter book. It felt worlds away from her usual stuff. Having said that, I haven’t given up on Karin just yet, but I sure hope the next book of hers is closer to her old stuff.